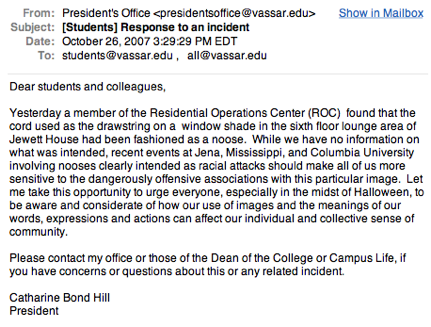 This past Friday, President Hill emailed the campus concerning the incident in Jewett House involving discovery of a noose. On Saturday, members of the Jewett House Team sponsored a discussion involving house residents and other students, faculty, and administrators who wanted to learn more about the incident in Jewett. Some of the faculty present also discussed the history and the meaning of nooses in response to student queries or comments. Attendees shared both personal and indirect experiences or understandings that made possible new levels of consciousness about the noose and other symbols of hate or oppression. At times, it was a difficult dialog, but the whole room was committed to the importance of it and everyone engaged in it in different ways, with very few people leaving before the discussion concluded. It was a meaningful educational experience for all involved. Such conversations can, however, leave students with more questions and confusion than they had on entering the room, and requests for more discussion were quite clear. Various House Fellows have begun making plans to continue the discussion, which are a critical part of strengthening our community, despite how difficult they can sometimes be. You can expect to hear more about these opportunities in your house or elsewhere on campus. We want to let you know that, in addition to continued discussion in various venues, there are other resources readily available to students as well. The Campus Life Response Team (CLRT), coordinated by Edward Pittman, Associate Dean of the College for Campus Life, met yesterday to consider other responses. That group, comprised of other staff members from the Dean of the College division, a faculty member, and a representative from College Relations, recommended that a broader campus-wide discussion might be useful. Some campus community members recall that similarly disturbing incidents have happened in past years. The goal is for the College to affirm that we be proactive and systemic in our response. Together we can ensure the inclusive and supportive community that we all desire to become. The Campus Life Response Team is prepared to help facilitate campus-wide discussions and hope to receive your comments and suggestions. Please feel free to contact the CLRT through the Coordinator, Edward Pittman (edpittman@vassar.edu or ext. 5426). We are committed to making every measure of progress towards greater community. Your participation is critical to the process.